I went for a short walk this morning and thought about elm trees. 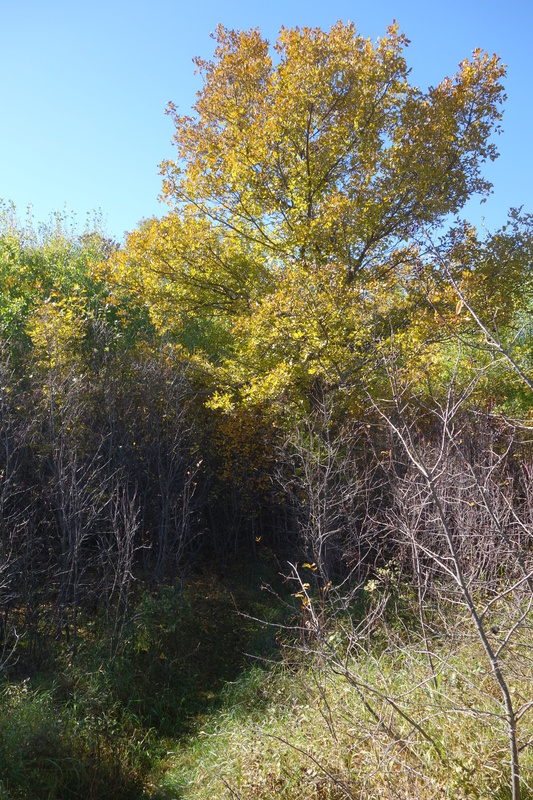 I’d never seen an American elm before I moved here–in the east, they’ve long been dead as a result of Dutch elm disease–but I’ve seen photographs of streets in Toronto and other cities lined with elms. They’re beautiful trees. Sure, they’re a little weedy, setting thousands of seeds that germinate everywhere you don’t want them, and they’re delicate, prone to damage from canker worms and tent caterpillars and winter kill, but they’re lovely nonetheless. 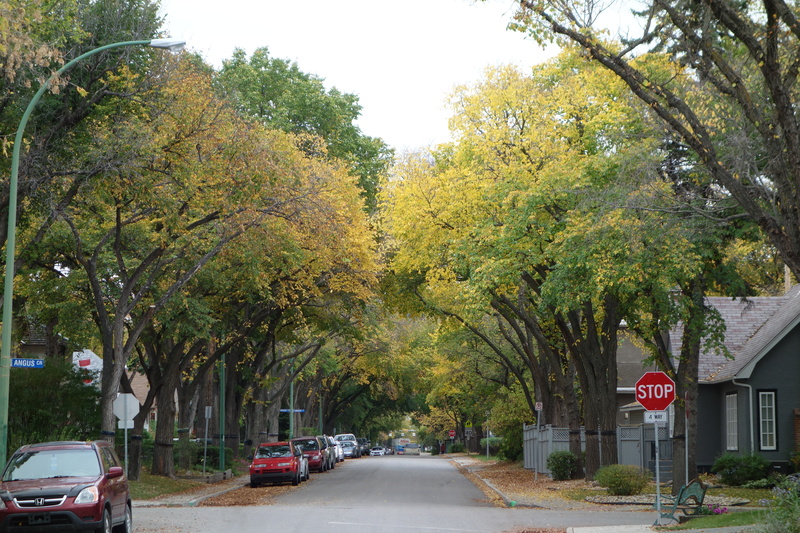 I like the way their canopy covers side streets almost completely, and I love their colour in the fall. They make me glad I live here. 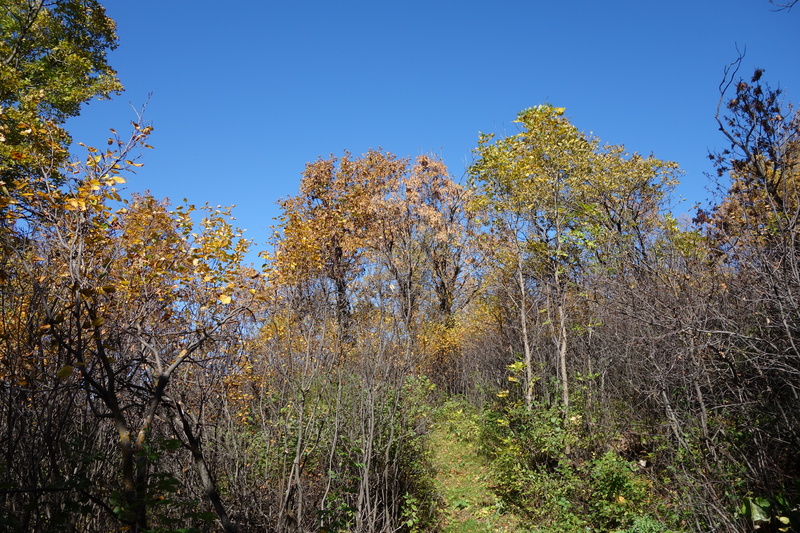 In the past week, the leaves have suddenly turned, and I thought it would be a good time to return to the Saw Whet Trail to see the fall colours before the leaves drop. Christine came along for the walk. 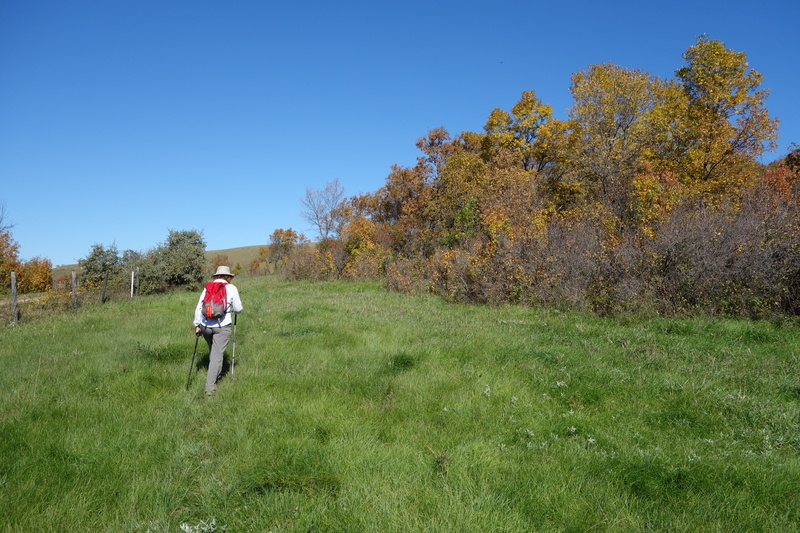 We decided to only walk the Saw Whet Trail and leave the Deer Valley Trail for another day. Another couple pulled into the parking area at the trailhead just before we arrived. They were carrying bicycles on the back of their SUV. “Is the trail okay for riding?” the woman asked me. I was noncommittal; if you’re a serious stump jumper, it would be okay, but I think it’s too difficult for casual cyclists, and I wasn’t sure what kind of riders they were. “Once you get out of the forest, it should be okay,” I replied. They set off, walking their bikes up the steep hill from the road. Later we came across their bicycles leaning against a fence. They had decided that the riding was too difficult, apparently. A while later we met them walking back along the trail. “It’s kind of hard to ride,” I said. “Yeah,” the man said, “we’re going to ride somewhere else.” That was the first time I’ve seen anyone else using the trail. 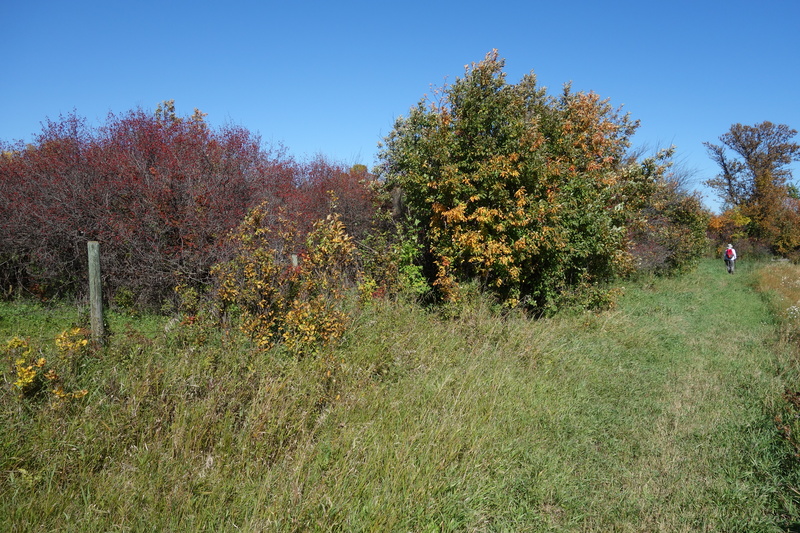 The colours were beautiful: the ash trees bright yellow, the chokecherries and Manitoba maples a rusty orange, the little bluestem on the south-facing hills a reddish purple. 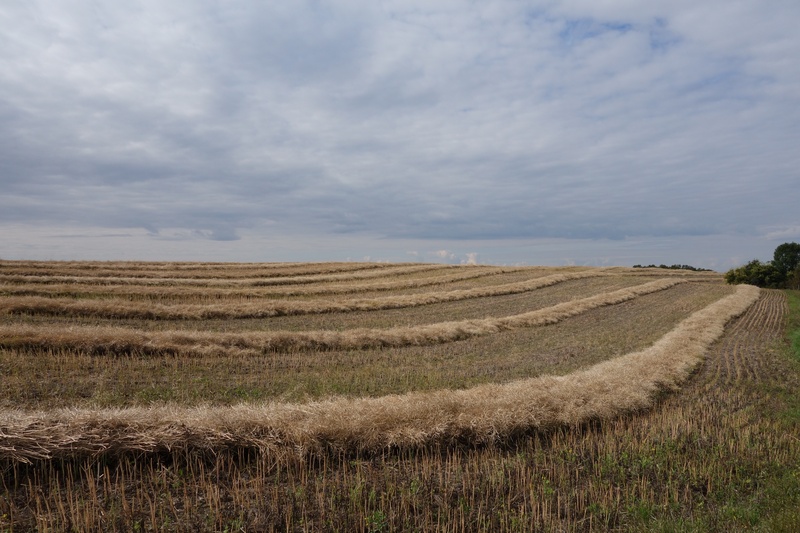 Despite the warm weather over the past week, the harvest has not advanced at all; the swathed canola is still swathed, the wheat and flax remains uncut. There were lots of grasshoppers. One found its way up Christine’s pants; another was in my boot when we got home. And, of course, there were lots of mosquitoes. I saw one hawk–I wonder if it’s one of the pair I saw earlier–but it paid no attention to us. We walked past a corral along the Seven Bridges Road. For the first time the horses were close to the road. 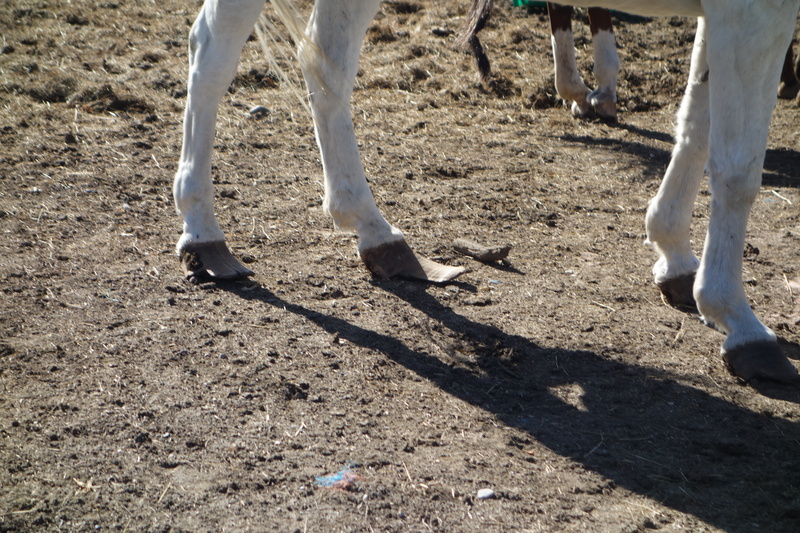 One of them is lame; the front of his hoof needs to be trimmed and he’s having trouble getting around. I’ve never seen anyone around the corral and it looks like the horses are pretty much left to their own devices, eating on the adjoining pasture and drinking out of a slough. When we were walking back, though, both horses had returned to the pasture up the hill, so despite his discomfort that gelding is able to get around. 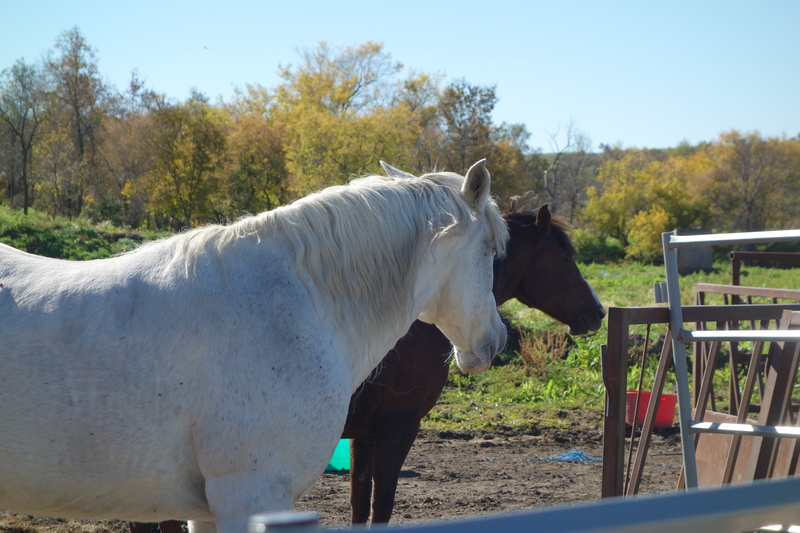 We’re going to call the Humane Society but I doubt their jurisdiction runs outside of the city limits and I’m not sure how to describe where the horses are located. It was another beautiful day for walking. Once again I found myself very grateful to the Trans Canada trail people for organizing this trail. 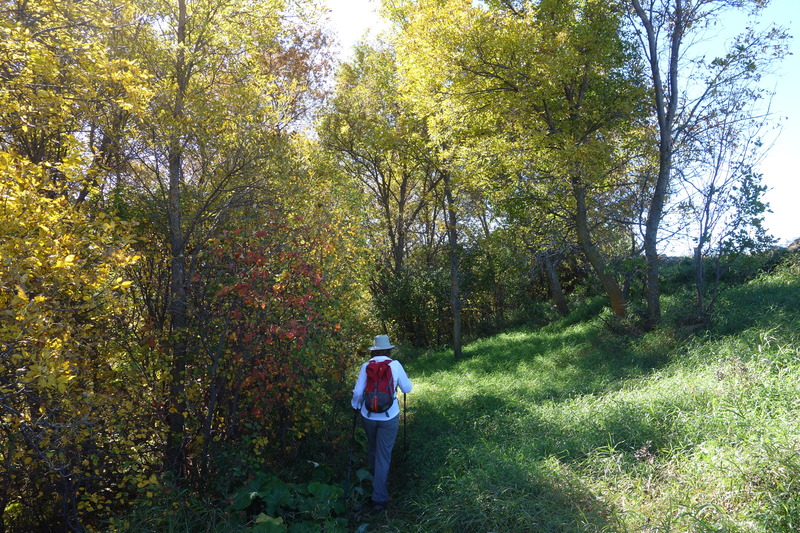 The fall colours are lovely; I hope I can go out for another walk there next weekend. I wonder what the trail would look like in the spring. I guess I’ll find out in six months or so. I promised myself that I’d walk the Saw Whet Trail again, and soon, so yesterday I drove out to Lumsden and parked at the trailhead. I’m finding the return to full-time study stressful and thought a long walk would ease my nerves. This time, though, I remembered to bring my camera. By starting at the Saw Whet trailhead, I avoided the long and not very interesting walk out of the village. 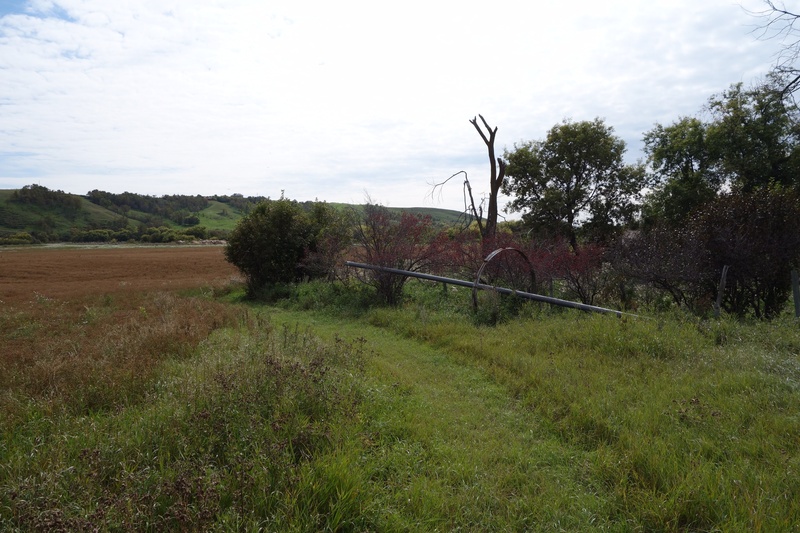 I was a little late starting and thought that if I had extra time, I could walk to the end of the Deer Valley Trail. And that’s what I ended up doing. I saw a few bootprints where the trail had been wet this week, but like last weekend I was the only person walking. 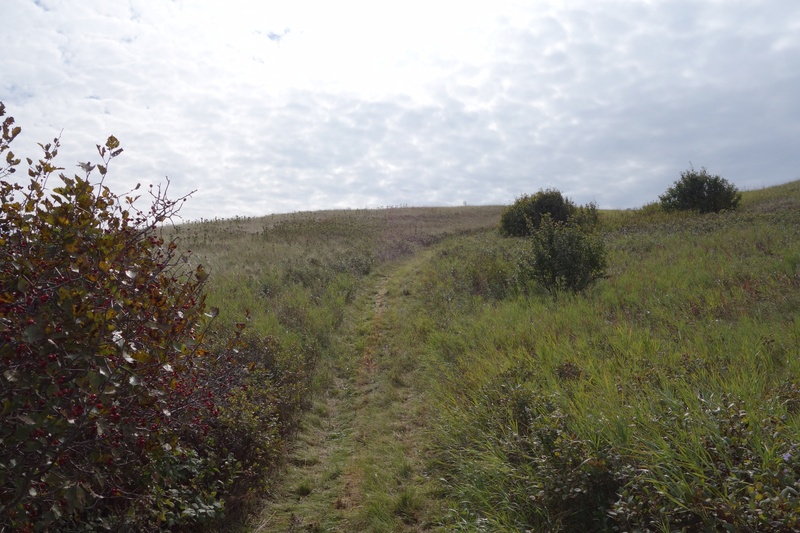 Maybe this trail is one of those “best kept secrets” but it deserves to be more traveled. 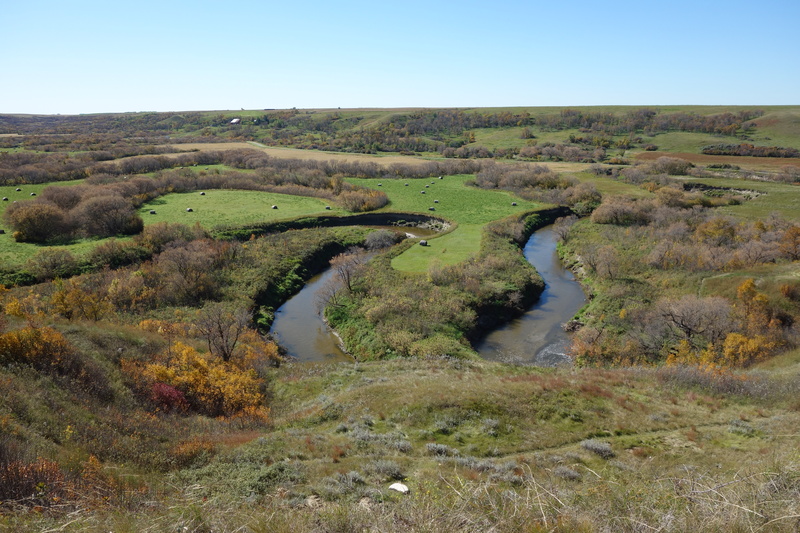 The trail crosses the divide between the Qu’Appelle and Wascana Creek valleys, and then it follows Wascana Creek for a while. I think I like the hillier part of the trail better than the flat valley bottom. I was thinking about that, walking along the chokecherries that screen the creek from the trail, when I hard something crash down the bank and splash across the creek. I looked through the bushes and saw a big white-tail buck climbing the bank on the other side of the creek. We stared at each other. Then the moment was over and he ran for cover while I fumbled for my camera. He was gone before I was ready to take his picture. 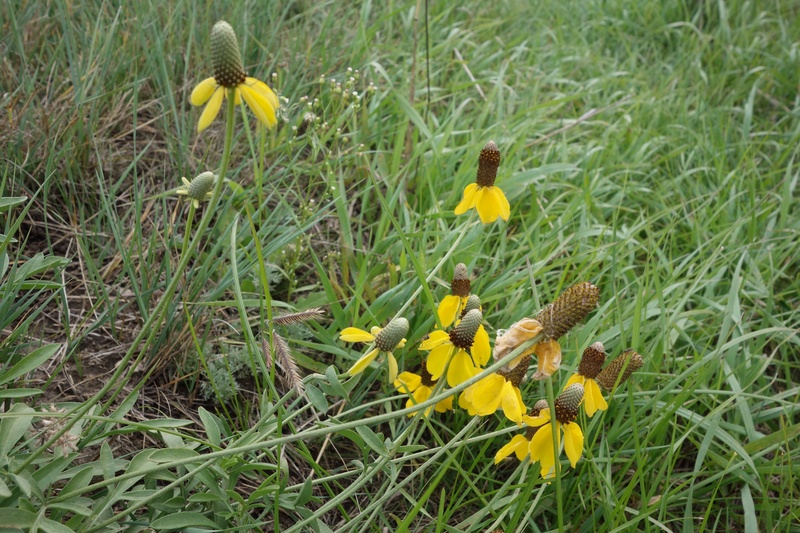 The moral of the story: even the flat parts of the prairie can surprise you. He wasn’t the only creature I saw. 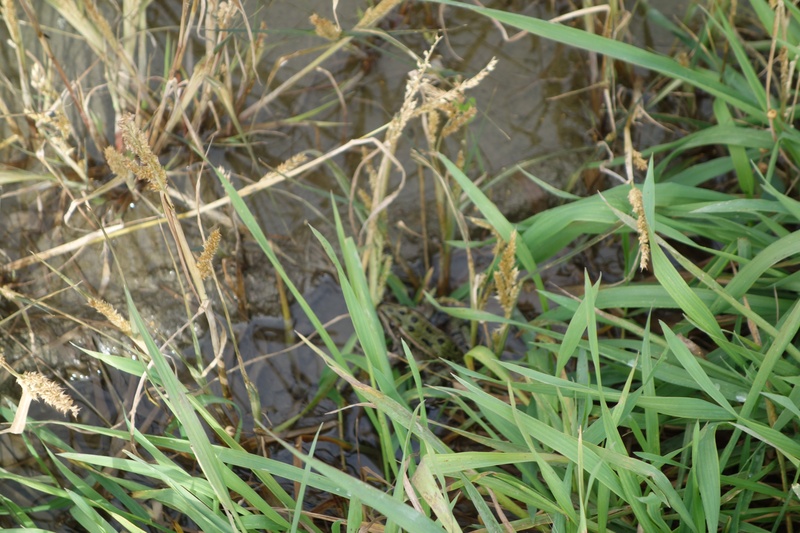 What last weekend I had taken to be toads on the trail near Wascana Creek turned out to be leopard frogs. I was surprised by a couple of garter snakes and thought about the Emily Dickinson poem about the “narrow fellow in the grass.” I saw a pair of hawks, too. I don’t know if they were the same ones I saw last weekend. This time they were less interested in me and more interested in finding rodents in a field of flax. 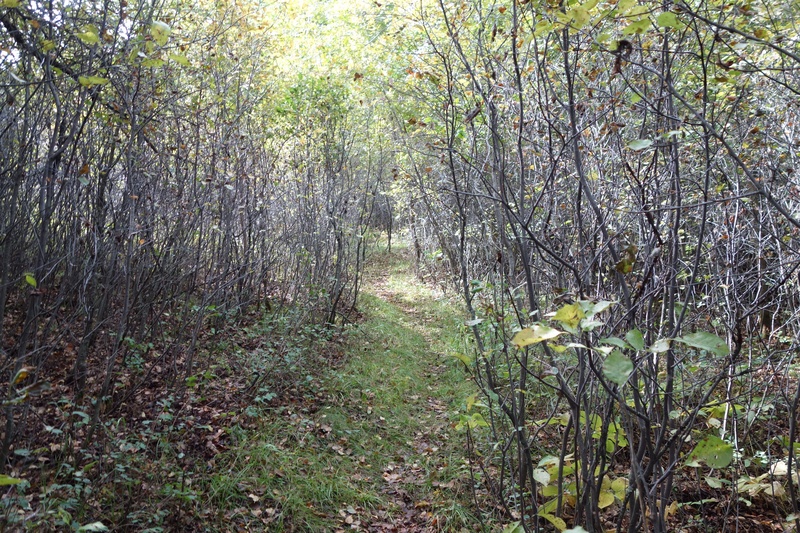 The Saw Whet Trail isn’t very long, just about six and a half kilometres from one trailhead to the other. 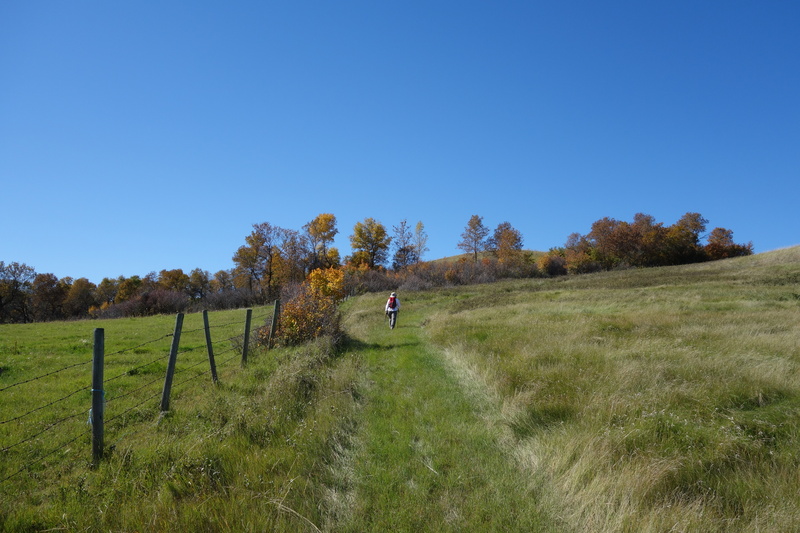 The Deer Valley Trail is another five kilometres. I walked it to the very end. 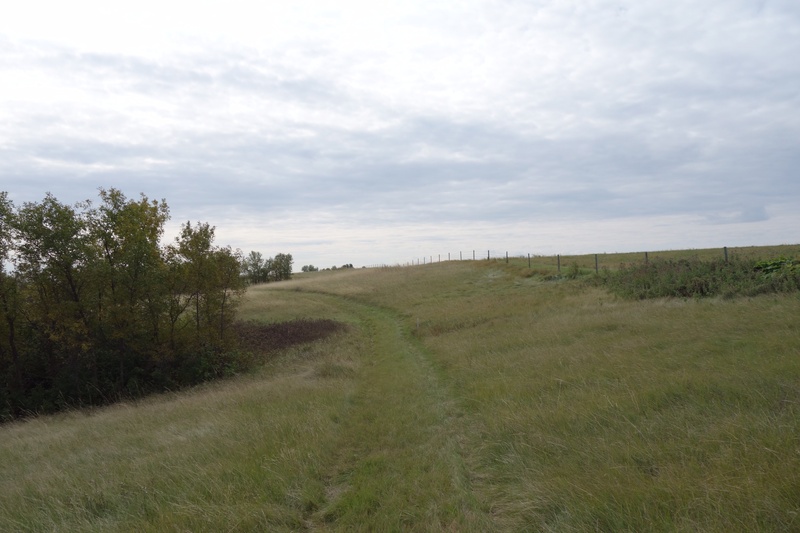 It winds around the Deer Valley housing development, over the native prairie that remains between the houses and the golf course, and ends up at what used to be a bridge over Wascana Creek. 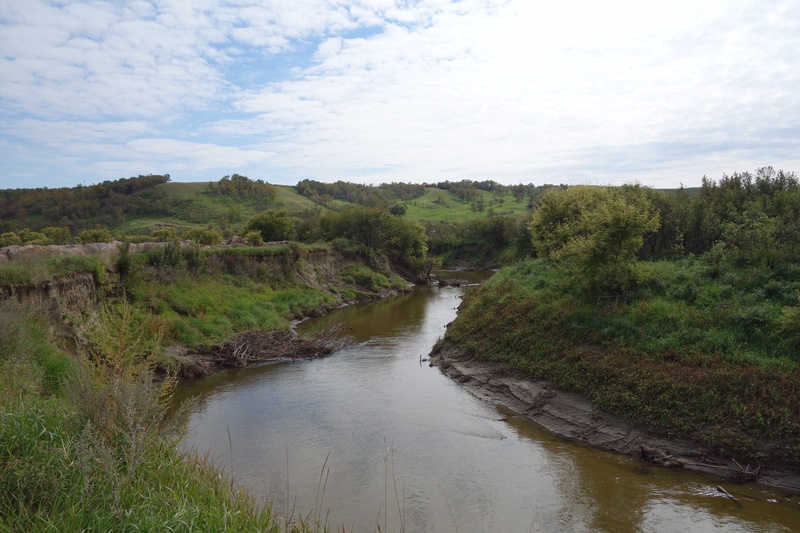 The bridge was washed out during a storm in the 1950s, but you can see what’s left of be the road between Lumsden and the Number One highway. 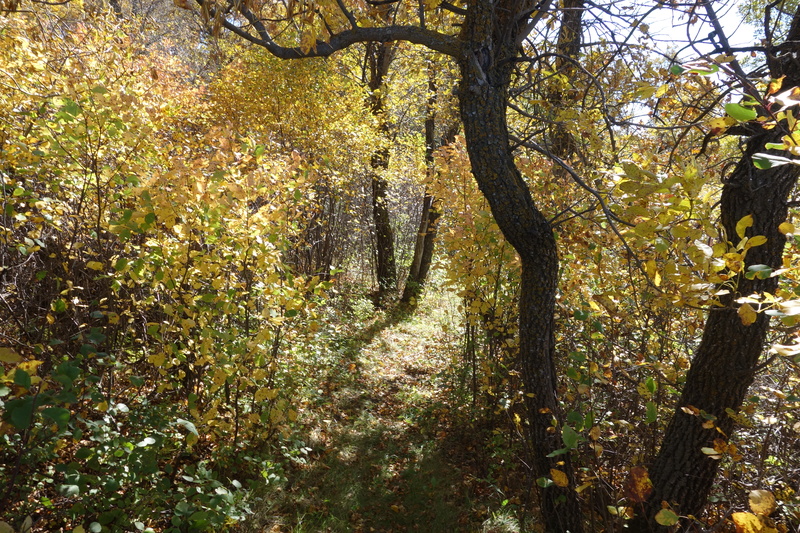 The Deer Valley Trail is okay, but it suffers in comparison to the Saw Whet Trail. 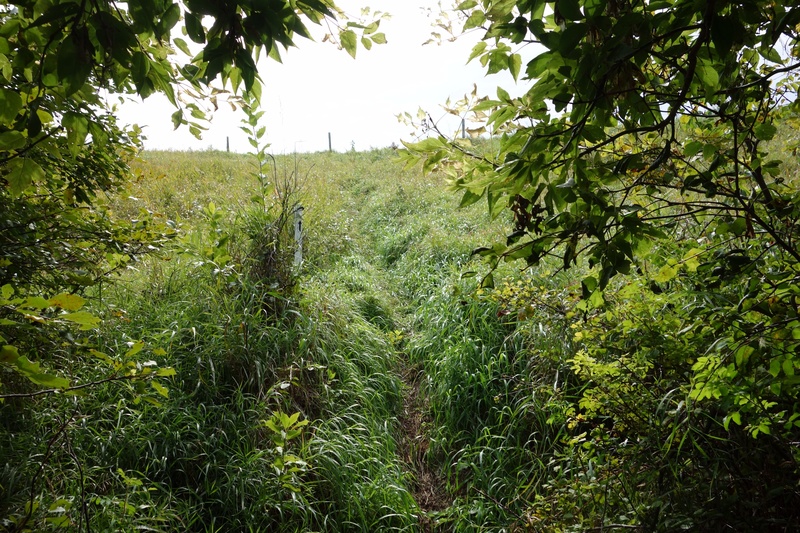 It’s not as well marked, and the footpath tends to peter out between waymarkers. 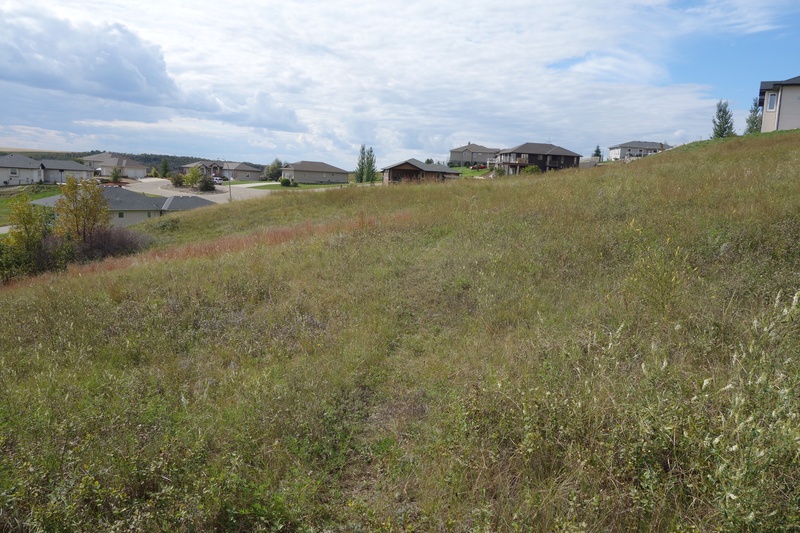 And walking through the subdivision is less interesting to me than walking over hills and through valleys. I called the houses “jerrybuilt McMansions” in my last post and I was thinking that sounded rather judgmental and petty until I noticed that one of the houses there has been abandoned because of a structural failure. 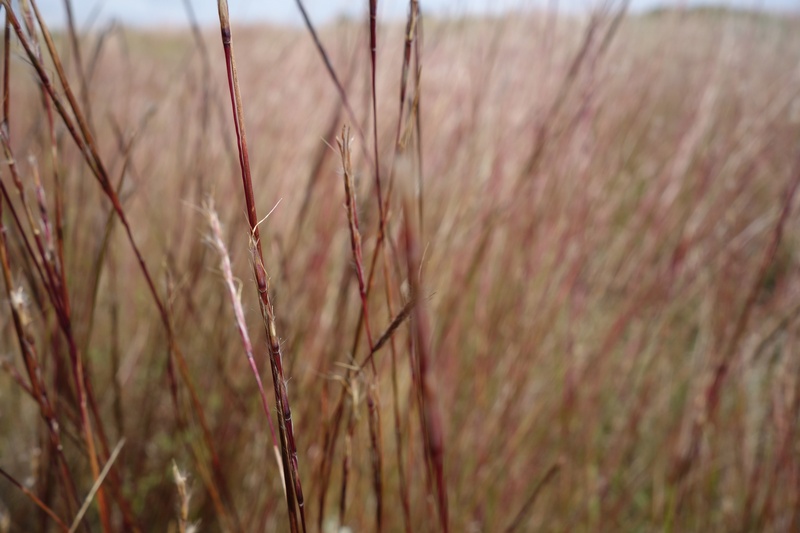 I did enjoy walking through the prairie; the south-facing hillside was covered in one of my favorite grasses, little bluestem. 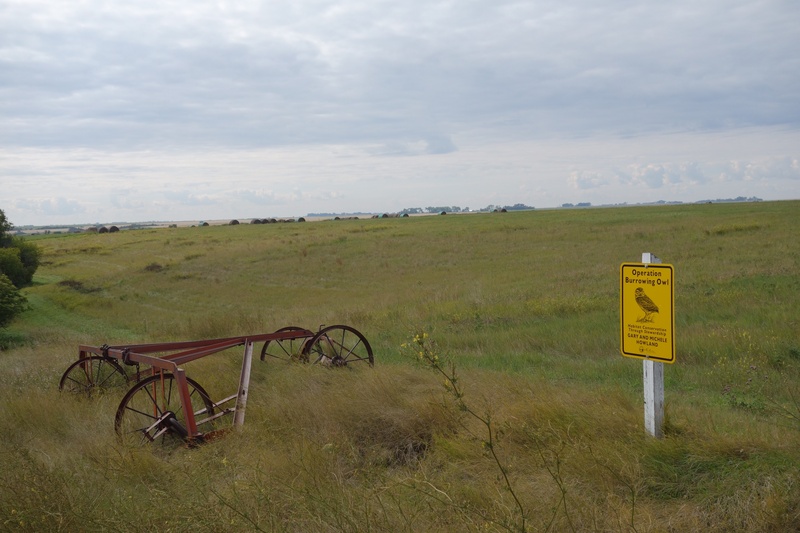 I noticed, though, that weeds introduced when the houses were built are starting to move into the prairie, and I wondered what the future will hold for that remnant grassland. Nothing good, I fear, as more houses are constructed and more weeds introduced. 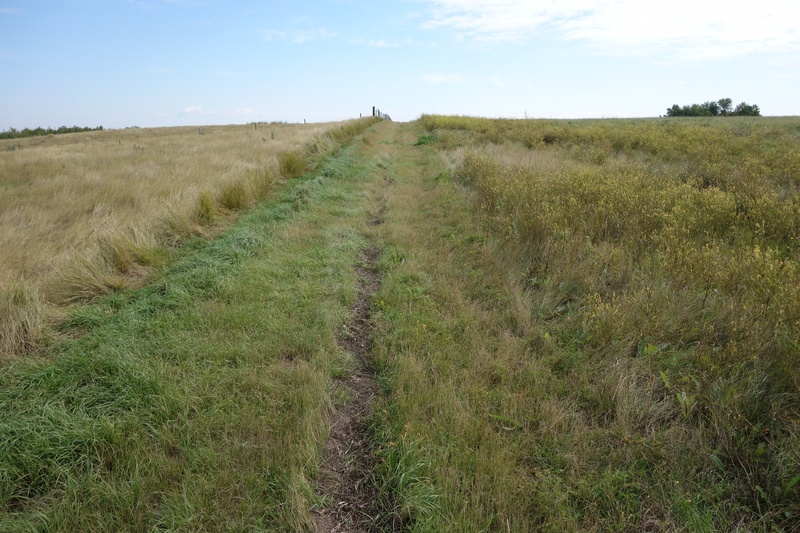 One thing I’ve learned from my own small attempt at restoring a native prairie: the weeds always win. It was a great walk, and at the end of it I was tired, in a good way, and happy. Christine says she’s going to come along with me next weekend. I hope so; it would be fun to walk the trail with someone else. 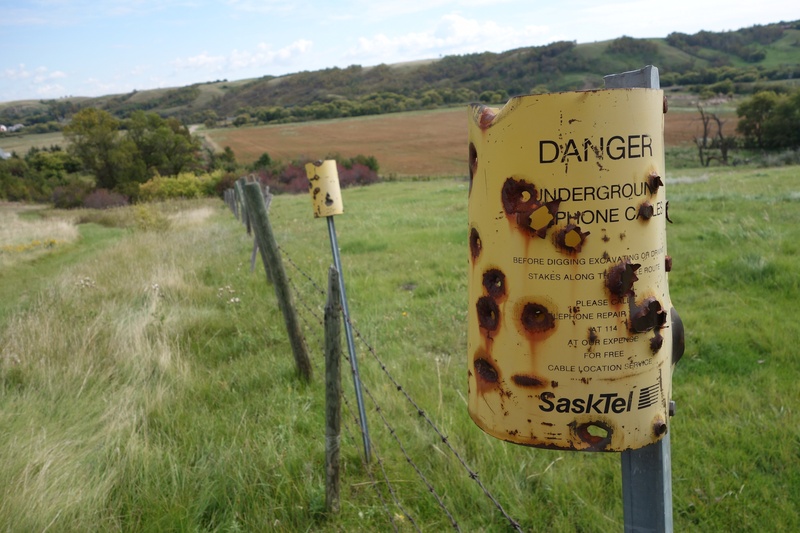 I had heard that there was a walking trail in the Qu’Appelle Valley, part of the TransCanada Trail, and that it ran from somewhere in Lumsden to Deer Valley, a golf course and housing development 10 or 15 kilometres south of the village. I didn’t know much more than that. The maps I found online weren’t all that detailed, but I had a general idea of where the trailhead was and, as I wrote here recently, I was determined to find a new and interesting place to walk, one I couldn’t complain about in a blog post, and something told me that this new trail might be the one. So yesterday morning I parked the car in Lumsden (which meant missing the second half of Michael Enright’s interview with Clive James on “The Sunday Edition,” but I can get the podcast, right?) and started walking. 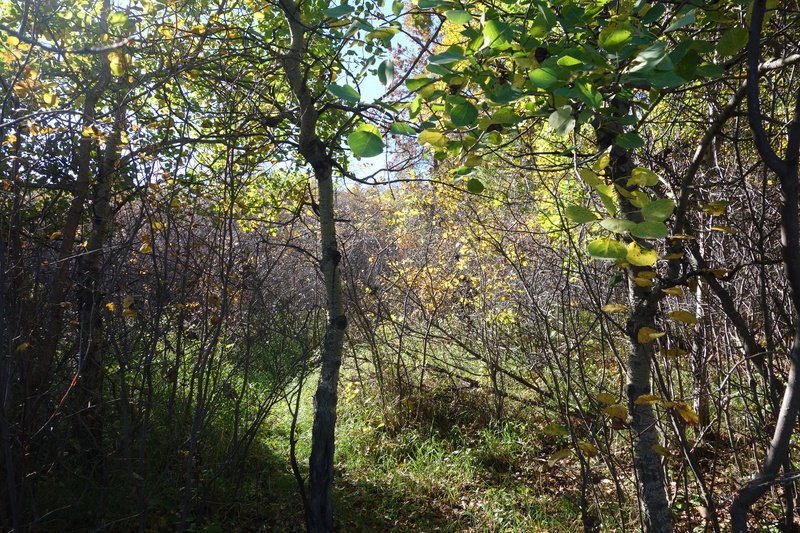 I walked along James Street and turned on Qu’Appelle Drive–that’s what the maps seemed to suggest. There were no waymarkers, though, and I wasn’t sure I was headed in the right direction. 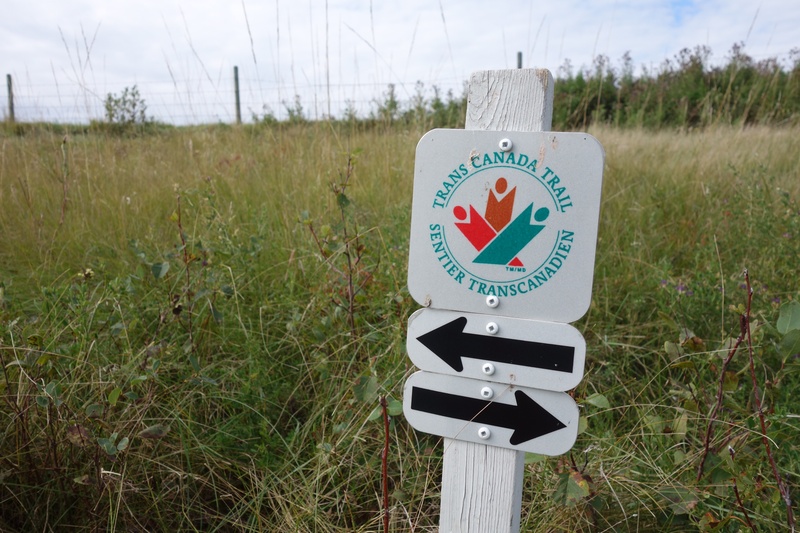 After about half an hour or so I saw a sign warning motorists that walkers on the TransCanada Trail would be walking along the road up ahead. So I wasn’t on the trail but I was about to be. 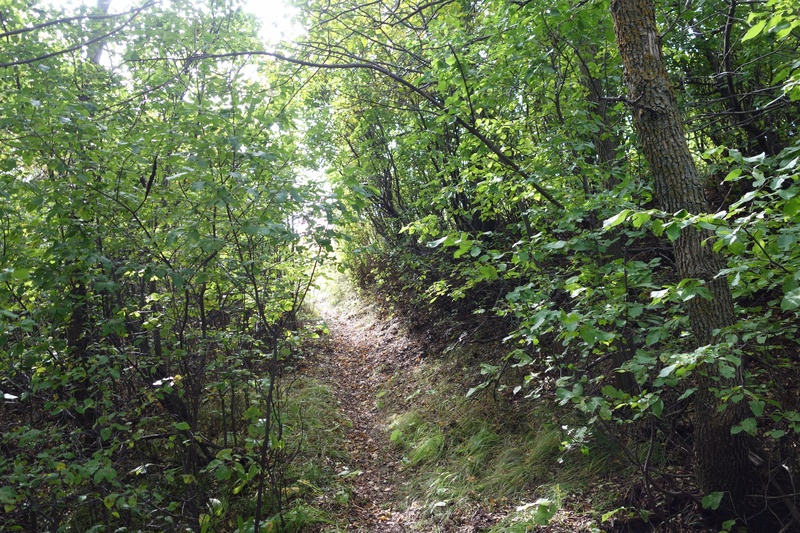 When the trail met the road, the waymarkers directed walkers to travel along the south ditch. Okay, I thought, I’ll give it a try. 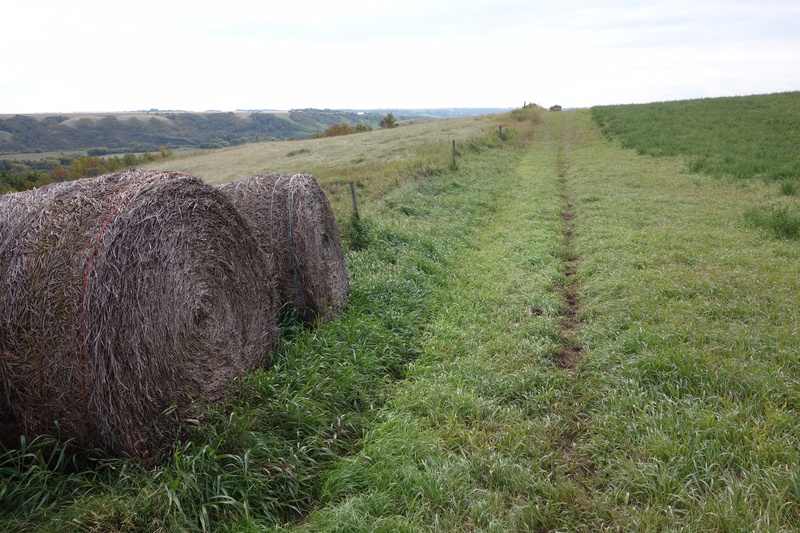 At first the going was okay because the ditch had recently been cut for hay. 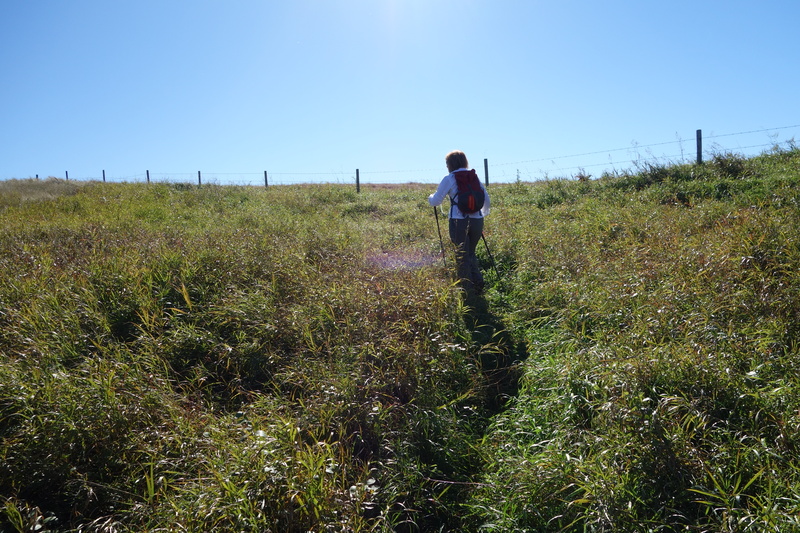 But soon I was wading through thigh-high grasses and weeds. 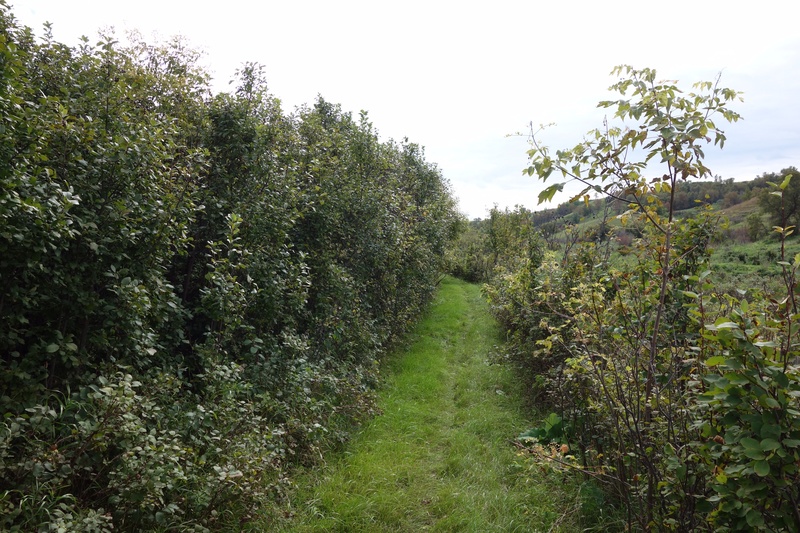 There were few signs that anyone had walked along that way, except by the chokecherry bushes, where the grasses had been tramped down by people who had come to pick the fruit. After a while I gave up and returned to the road. 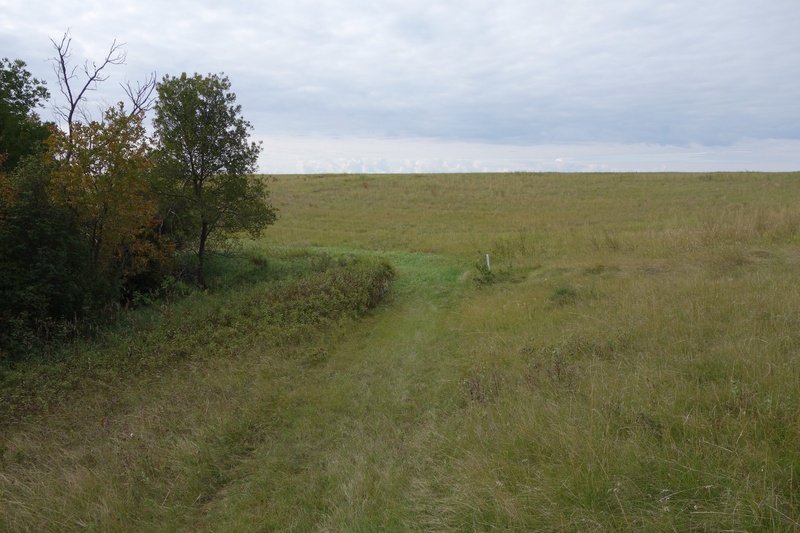 I’ll keep watching the waymarkers in the ditch, I told myself, but I was discouraged and wondered what the trail was going to be like after it left the road and headed south, cross-country, towards Deer Valley. Maybe it’s only notional, I thought, something that exists on paper but not in actual fact. I didn’t have to worry. After an hour or so of walking I came across a big map board with a shining red roof. This was the beginning of the Saw Whet Trail. 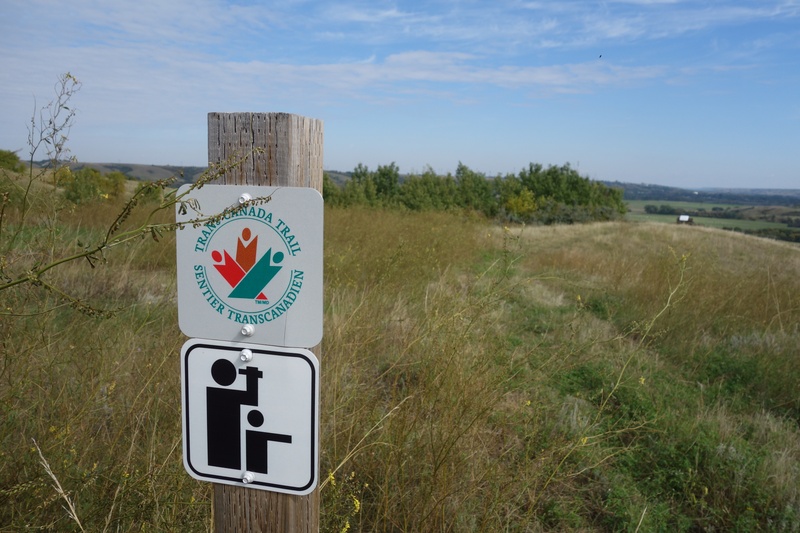 According to the map, I’d been walking along the Lumsden Valley Trail since I saw the signs about the TransCanada trail, and if I walked all the way to Deer Valley, I’d be walking on the Deer Valley Trail. But if I turned south at the map board, I’d be walking on the Saw Whet Trail. So I turned south. It was a brilliant day, warm and sunny, a perfect summer day in this part of the world. The trail was well-marked. 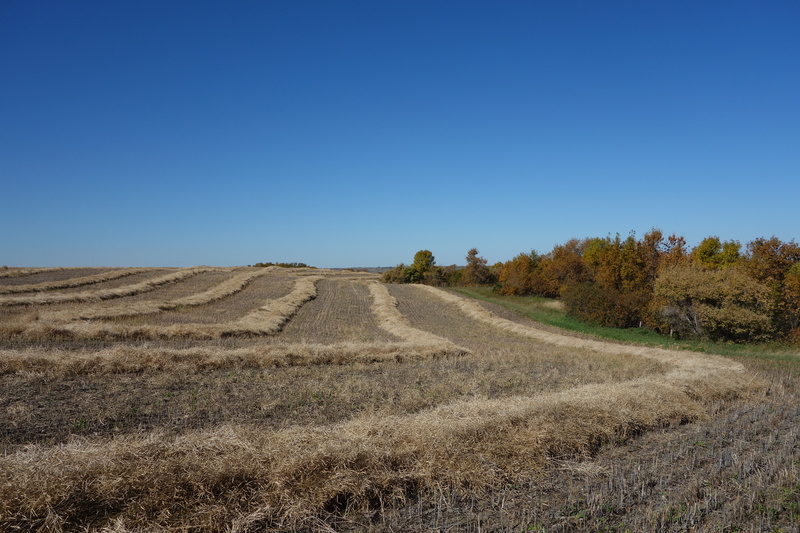 It went through forests in coulees, up over pastures (some of which were unbroken native prairie), and alongside fields of canola and flax. 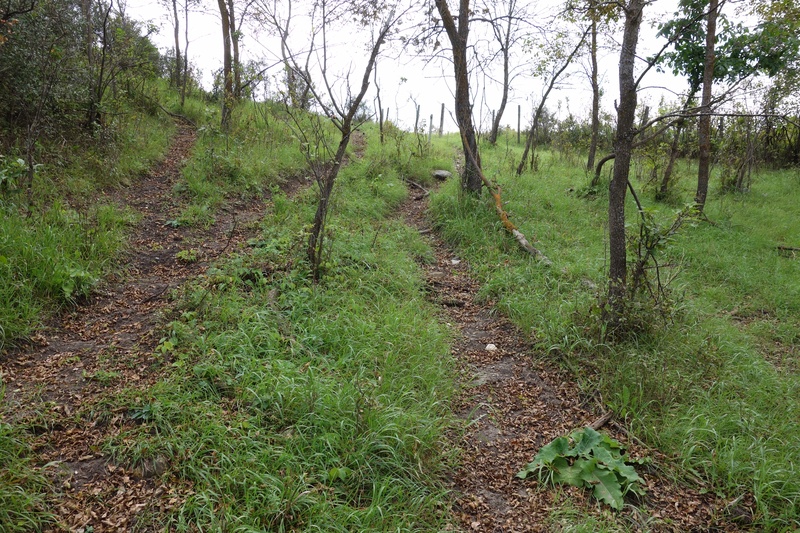 For most of its length, the trail was mowed so it was impossible to lose the path. 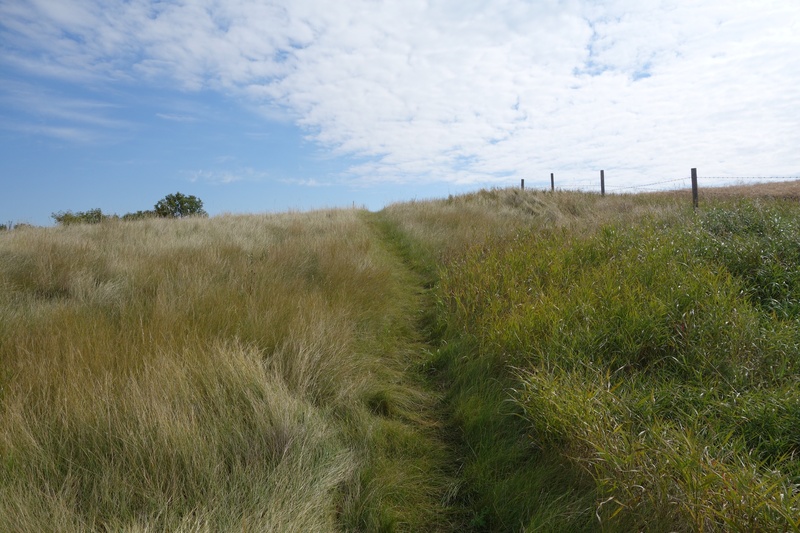 I suppose there aren’t enough walkers to keep a footpath open; as Robert MacFarlane points out in his book, footpaths are created and maintained by the simple act of walking along them. Where the path wasn’t mowed, though, the white posts that act as waymarkers were usually clearly visible and there was no need to worry about getting lost. 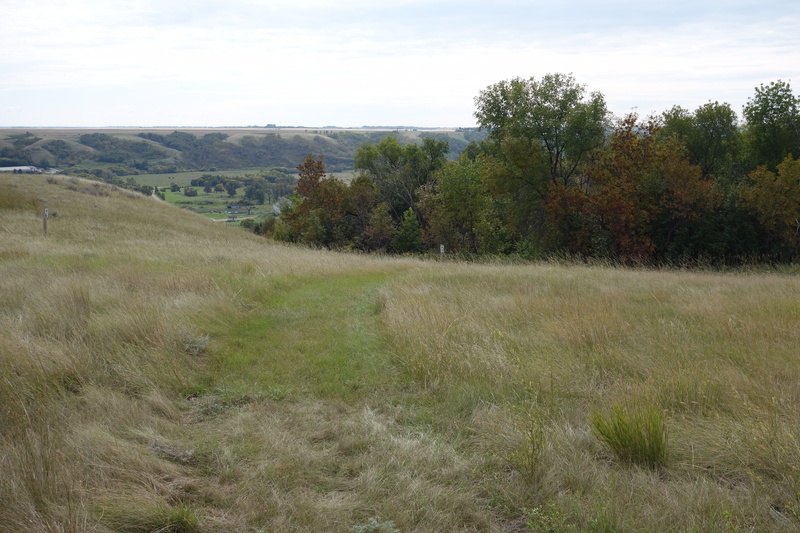 The path went over the hills dividing the Qu’Appelle Valley from the Wascana Valley, and then descended to follow Wascana Creek. I made a couple of detours to lookout points (all named after pioneers in the area) and to a makeshift campground (I wonder how many visitors it gets?). 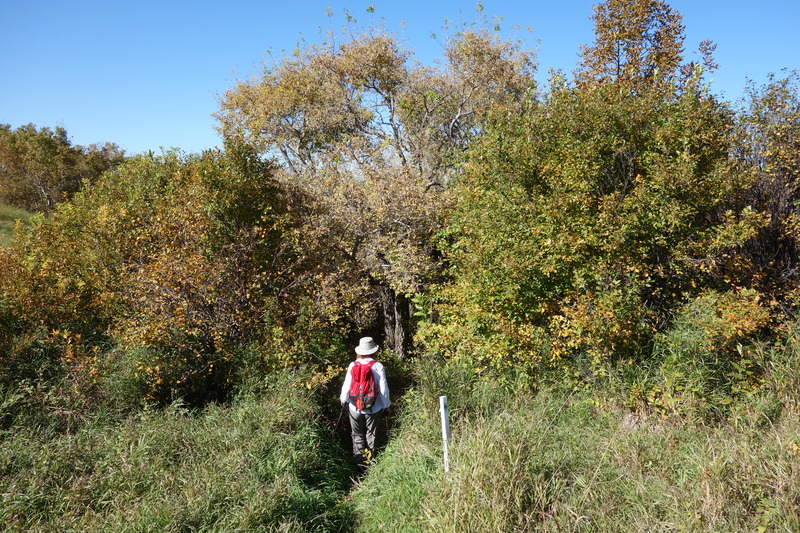 For a while the trail went along the aptly named Seven Bridges Road (which crosses Wascana Creek seven times). There I missed a turning and stayed on the road longer than I needed to, but there was little traffic and it really didn’t matter. Then I came to the end of the Saw Whet Trail: another red-roofed map board. There’s a sculpture of an owl, which is appropriate, since the name of the trail refers to the northern saw whet owl, a smallish bird that spends its winters around here. 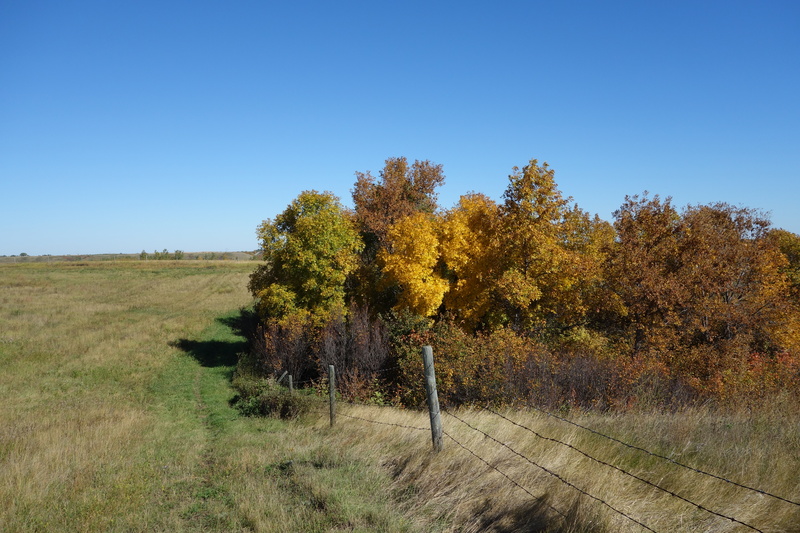 The Deer Valley Trail continued up a side road, so I decided I’d carry on and see what it was like before I turned back towards Lumsden. 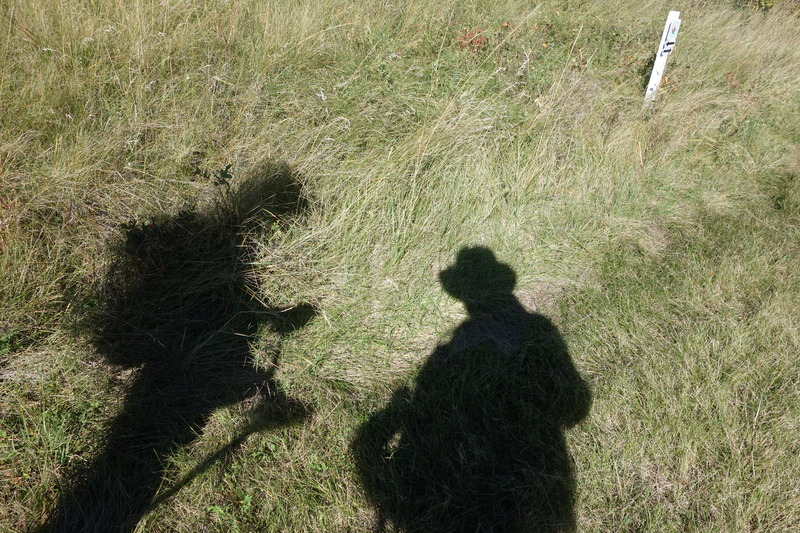 Again the waymarkers directed me to walk in the pathless ditch. 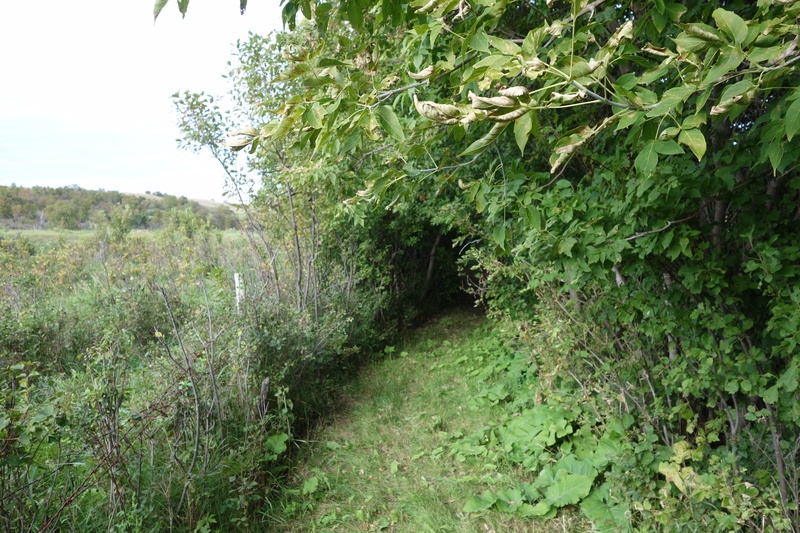 I wonder why the path isn’t mowed in the ditches here. 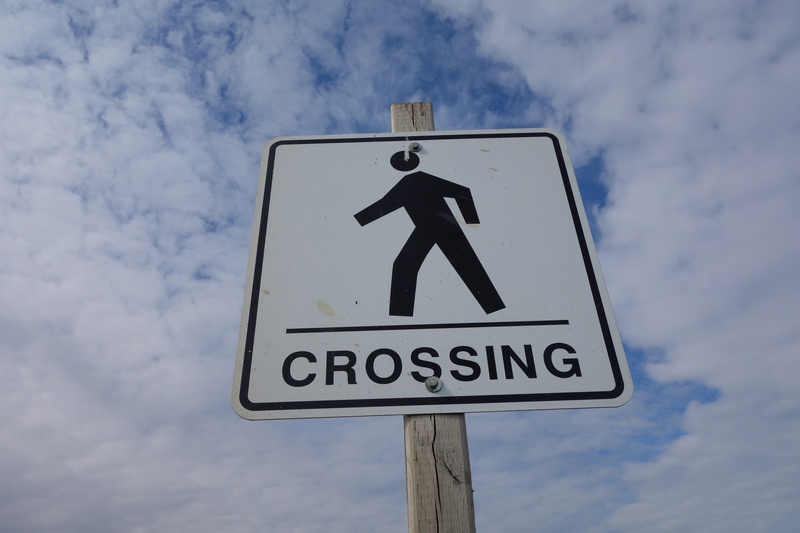 Maybe those signs are there to relieve the TransCanada trail people, or the local RM, of any legal responsibility if someone walking along the road is hit by a car. I don’t know. There was another lookout, and then the trail turned along the road into Deer Valley, a development of jerry-built McMansions overlooking a golf course. I walked as far as the club house parking lot, where there was another map board, and then I turned back. I suppose I could’ve explored the club house or gone to the 19th hole for a beer, but I knew I had a long walk back and I didn’t feel like having a conversation about whether or not I was a member. Retracing my steps was much quicker, because I didn’t make any diversions or side trips, and after seven hours and some 25 kilometres of walking I found myself back at the car. I was thirsty because I’d run out of water, and I was sunburned and my legs were sore, but I was very happy. The Saw Whet Trail was the best walking experience I’ve had around here since I started training for the Camino last year. The terrain is varied. There are hills to climb and descend. It’s quiet, except for the two hawks that kept following me, and the small plane flying in circles over a neighbouring valley. The act of walking on footpaths is, as always, wonderful. I loved it. I forgot my camera, so I don’t have any pictures, but I’m going back next weekend, weather permitting, and I’ll be sure to bring it then. The occasion of Ferris Jabr’s piece on walking, I think, was Adam Gopnik’s review of several books on bipedalism in the September 1 issue of The New Yorker. Gopnik discusses several books about walking, new and old, including French philosopher Frédéric Gros’s A Philosophy of Walking (currently in my ever-expanding pile of books-to-read) and Matthew Algeo’s Pedestrianism: When Watching People Walk Was America’s Favorite Spectator Sport. Walking? A spectator sport? Who knew? I tried reading the online version of Gopnik’s review but I always have trouble concentrating when I read off of a screen, so I resorted to the print copy of the magazine that arrived in our mailbox on Tuesday. The online version, though, can be found here. It’s worth a look, especially for Gopnik’s own memories of walking in Manhattan in the 1980s and how much has changed in the ensuing 25 or 30 years. I saw a link to this article by Ferris Jabr on Facebook this morning. It’s a summary of the connection between thinking and walking, using experimental evidence as well as quotations from writers, such as Virginia Woolf, who wrote about the connection between walking and creativity. It’s very much worth reading. I walked to work and back today. 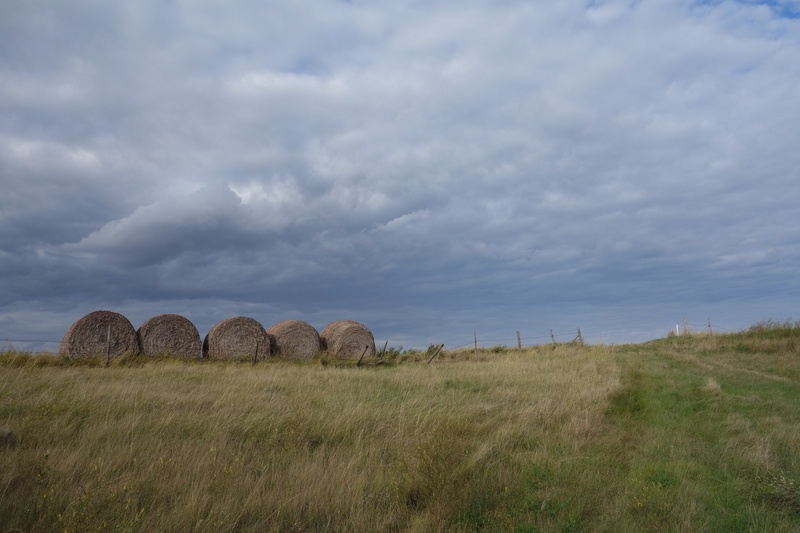 It wasn’t a long walk–nine and a half kilometres–but it was quite lovely. It was a warm, sunny fall day, a great day to go for a walk. 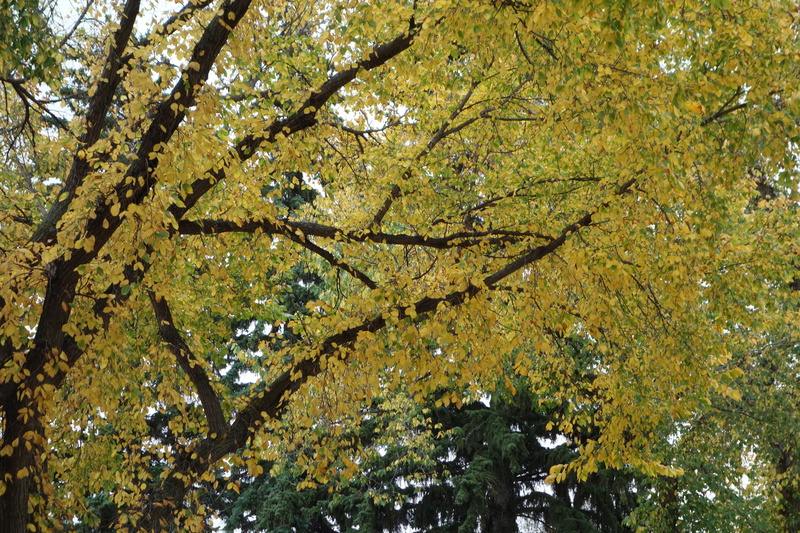 I use the f-word deliberately, because there’s been a chill in the air the past few evenings, and some of the leaves on the poplars are starting to turn yellow. Some of the songbirds have already headed south. It won’t be long before the first frost and then, after that, another winter. I find the winters here very hard. They’re so long and so cold. I used to love the fall, but now it makes me think of winter and that fills me with dread. As I walked, I thought about my last post here, its negativity and ingratitude, and I felt bad. Yes, walking here isn’t as nice as walking in some other places, but I deliberately chose an unattractive route, in part to create a stark contrast between this city and the Cotswolds. And despite the paved paths, walking in the park here can be very nice. I didn’t have to be so negative. 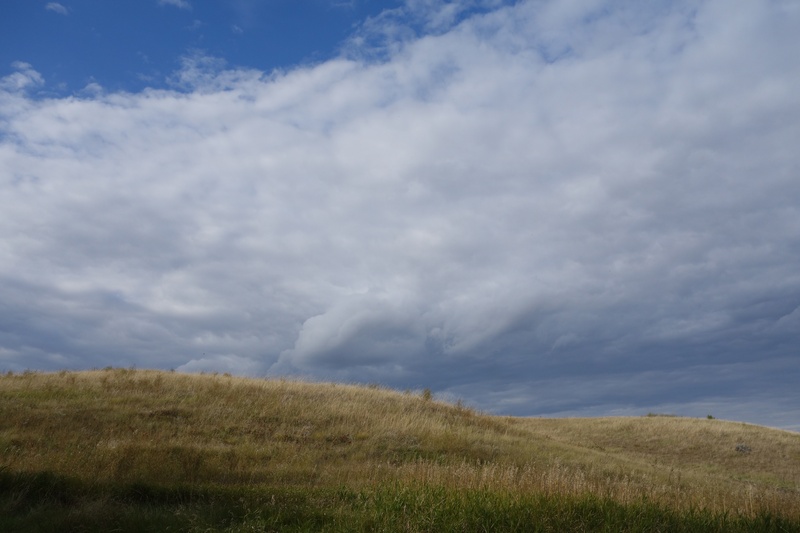 I thought about the things I want to accomplish in the next 12 months and, as usual, the act of walking helped me think about them in new ways. I also thought about the Camino Francés, which has its unattractive parts: walking into Logroño, for example, or Burgos, or Léon–any of the larger cities. Walking here is no worse than walking in those cities, no uglier and no more dangerous. When I started walking around the city again last spring–I tried to walk during the winter but I got too busy and gave up–I thought about Burgos and Logroño and decided that it was more fair to compare walking here to walking there. What isn’t fair is comparing any urban walk to the Cotswolds. Of course, because there are no footpaths here, because one has to walk along grid roads, the walks in the country here can’t be compared to the Cotswolds, either. 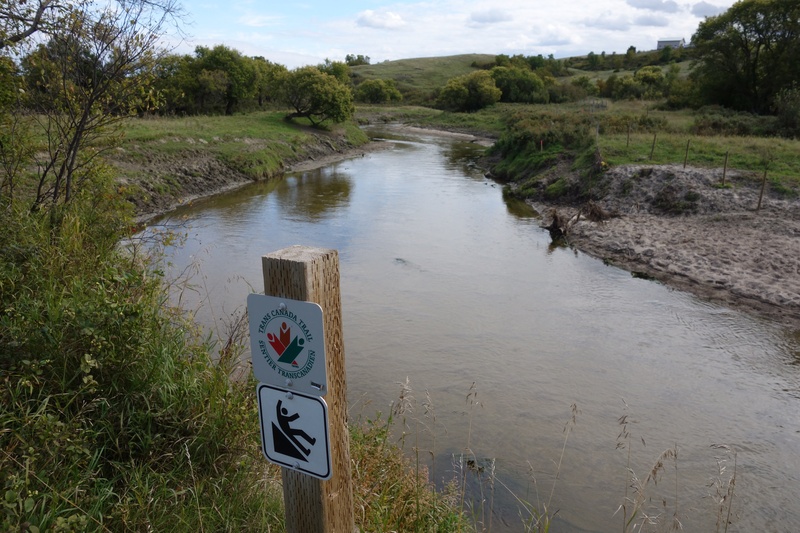 There might be one exception: the TransCanada Trail runs from Lumsden, a village north of the city, to a golf course development called Deer Valley, and it looks like at least part of that trail is a footpath that runs along a creek. I’m going to try that walk this weekend. I won’t have a lot of time for walking as the semester progresses, since I’m going back to school for the first time in 20 years this fall, but the term is just starting, and I’m sure I can make time for one more long walk. 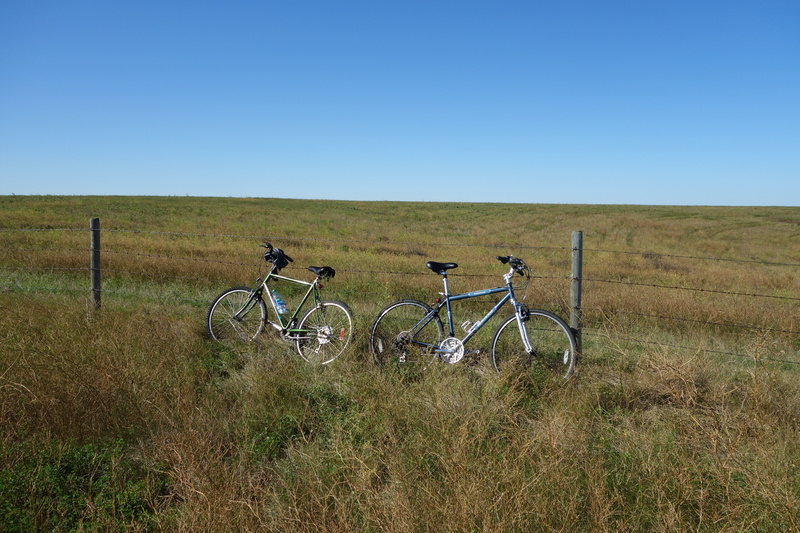 It’s supposed to be 32 kilometres from Lumsden to Deer Valley and back. I’ll take my camera, of course, and this time I’ll make a point of looking for subjects that aren’t hard to look at. That’ll be my way of apologizing for my last post.